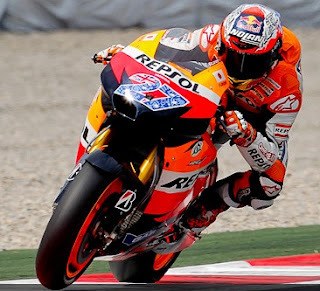 Australian Casey Stoner managed to minimize the difference between left with standings leader Jorge Lorenzo, Honda For this, the victory was the third time during the race season this year. Stoner did not give a long time for Lorenzo to lead the way race. 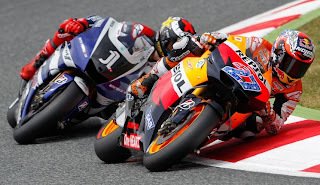 The reason is entering the third lap, Repsol Honda rider had already made it past Lorenzo and led the race. Ben Spies, who appear less impressive in four games early, more impressive race in Catalunya this. Riders from the United States defeated Andrea Dovizioso in third. Until recently, Lorenzo still maintain top positions in public with a value of 98 out of the five races that have been held. He is only seven points adrift of Stoner, who also appeared as the winner in Qatar and France. Dovizioso managed to fix the position to third with a value of 63, two points ahead of Dani Pedrosa, who did not perform in Barcelona due to injury.